Folks were so glad to get electricity to their farms and homes they stepped up and helped by whatever means necessary to get the "juice" flowing. Darrel Parker of Lantry rigged up his tractor to help construct line. 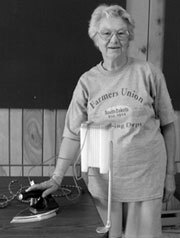 Lifelong co-op member Grace Bubbers recalls winning an electric clothes iron at the 1951 cooperative annual meeting and not being able to use it until the crews were able to complete line construction to her rural Morristown home several months later. 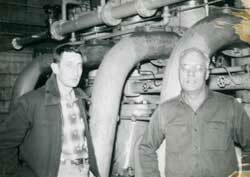 Manager Lyle Herriott and Jerome Payne in front of the Eagle Butte generator. Moreau-Grand purchased the generator and building from Mr. Payne. Roy Linderman (Left) and Adam Gellner working on the Timber Lake. Adam began his career at Moreau-Grand on October 1, 1949 as the first line superintendent. Roy started in 1953 and served the cooperative for 35 years. The mid 1940's not only brought troops home from WWII, it brought home to the Dakotas the promise of a brighter future. Up until this time electricity was mostly limited to local communities who ran their own power plants. The cost of extending the lines to their rural counterparts literally left most in the dark. Few area producers had wind generators and large glass cased batteries filled with acid. These were able to produce enough energy to have electric lights or power a radio. This, and other area meetings, laid the groundwork for the official organizational meeting of Moreau-Grand Electric Cooperative on May 1, 1946. 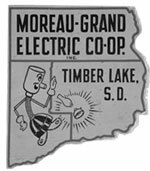 Moreau-Grand Electric Cooperative received word August 1, 1947, that their application for an initial loan of $500,000 was approved by the R.E.A. An office was established in the east room of the Timber Lake Municipal building. The building located in Timber Lake on the south east corner of block 9 also housed the existing generator. 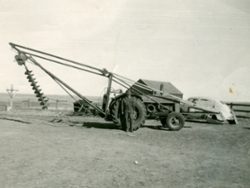 With the establishment of the local REA in place, survey work began to establish the first work plan. In true democratic fashion, each community put this to a vote. 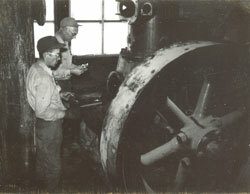 In the spring of 1949, the community of Isabel voted 99-1 to sell their generating facilities and join the cooperative. The following week, Timber Lake voted 158-42 to do the same. Shortly there after, Moreau-Grand purchased the generating plants at Firesteel and Trail City. Along with the purchase of the Timber Lake city light plant came its operator, Adam Gellner. Area communities benefited from the advantage of being cooperative members. Electricity replaced kerosene lanterns in homes and barns, bringing power for lights, refrigeration, appliances, and farm equipment dramatically improving rural life. Prior to his death, Fritz Lawien told of the times he helped friend and fellow businessman J.D. Kesling unload train car loads of electric appliances to stock his hardware store. The 1950's and 60's brought many milestones for the cooperative as it continued to provide safe affordable electricity to its member owners. As the membership grew so did the need for better facility for the cooperative. In June of 1960, Moreau-Grand Electric Cooperative dedicated its new office building. The same facility is used today. Upgrades were made to transmission lines, substations and facilities across the cooperative. Offices were added in McLaughlin and in Eagle Butte. New warehouses were also added at McLaughlin, Eagle Butte and at Timber Lake. This added much needed capacity to the cooperative service area. The increased demand for electricity also brought the need for the cooperative to manage peak electric usage. The members were alerted by radio ads designed to curb their electrical consumption during these peak times. Seeing the need to save costs and prepare for the future Moreau-Grand joined the Rushmore Electric power cooperative in April of 1983. 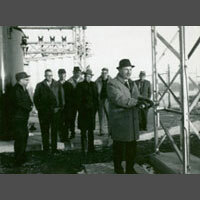 The following month Basin Electric Power Cooperative began construction and expansion of its coal fired power plants.This provided needed energy stability to the region. Today Moreau-Grand Electric Cooperative receives the electricity we distribute to our members from several sources. Hydro Electric from the Missouri River, coal fired power plants located in North Dakota and Wyoming and one of the largest cooperative run wind farms in the nation. Basin Electric Power Cooperative provides its members like Moreau-Grand Electric with 271 megawatts of wind energy from 181 GE wind turbines.brought the need for the cooperative to manage peak electric usage. The members were alerted by radio ads designed to curb their electrical consumption during these peak times. Seeing the need to save costs and prepare for the future Moreau-Grand joined the Rushmore Electric power cooperative in April of 1983. The following month Basin Electric Power Cooperative began construction and expansion of its coal fired power plants.This provided needed energy stability to the region. Today Moreau-Grand Electric Cooperative receives the electricity we distribute to our members from several sources. Hydro Electric from the Missouri River, coal fired power plants located in North Dakota and Wyoming and one of the largest cooperative run wind farms in the nation. Basin Electric Power Cooperative provides its members like Moreau-Grand Electric with 271 megawatts of wind energy from 181 GE wind turbines. No story about Moreau-Grand would be complete without our mascot, Willie Wiredhand. Willie made his first appearance in the February 1954 issue of the Moreau-Grand Hi-Line-Flashes. Farmers always hoped they would some day find a hired hand that would never tire, always be there, and always be ready for work. In 1951, Willie was chosen by rural electric cooperatives to serve as their national symbol of rural electrification. Today Willie serves hundreds of member systems across the nation. He appears everywhere in headquarters buildings, substations, billboards, signs, letterheads, annual reports, newspapers, and in a great variety of printed matter. Willie not only represents rural electrification in the abstract, but also the many ways in which farmers and other rural people can put electricity to use in their work and in their leisure.